Reflecting on behavioral incidents is a research proven way to make tangible change and prevent challenging behaviors from becoming cyclical. 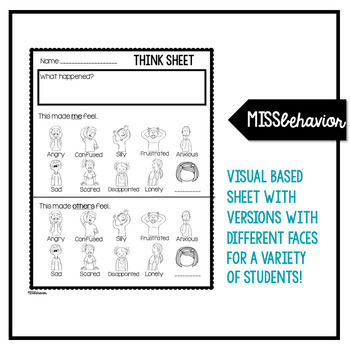 These differentiated and varied think sheets provide structure to often difficult conversations to create meaningful change and restorative results! 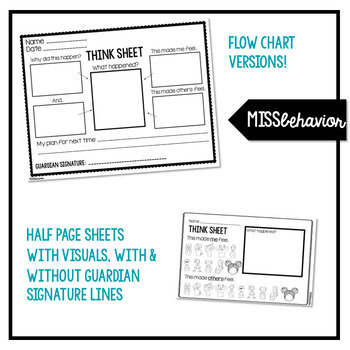 This product includes 11 think sheets, each version with and without a guardian signature line, to choose from. Sheets vary from having visuals, choices to circle, and written responses. 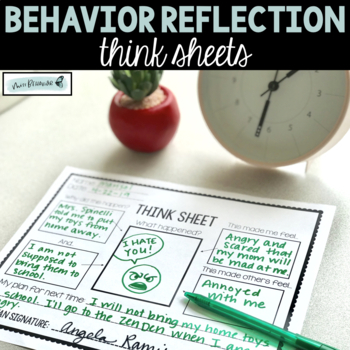 Help make your restorative conversations more structured and meaningful with well thought out behavior reflection sheets! Check out the thumbnails and preview for a deep dive inside. Follow me for behavior tips and tricks on how to help you teach and reach all of your learners. 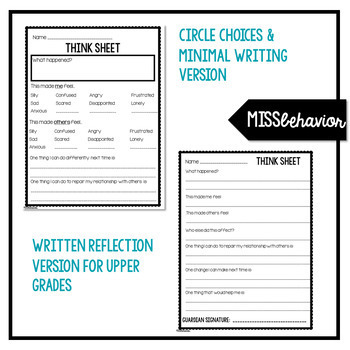 This resource is intended for use by ONE classroom teacher. Permission to copy for single classroom use only. Electronic distribution limited to single classroom use only. Not for public display without credit given to author. If you would like to share with your colleagues, please purchase an additional license. All rights reserved by author.